Why Do We Aerate Lawns? Our soils are of lackluster quality. Dense clay does not allow for water percolation easily. Aeration pulls cores of soil out of the ground to allow for deeper water percolation. This also allows for air to reach the root zone resulting in denser root clusters for each individual plant. Because the seed lands in a deeper protected pocket where moisture can remain longer, seeds tend to germinate better in aeration plugs. Environmental stress can lead to a decline in turf population and performance. Areas that have succumbed to environmental stress need to be repaired. Overseeding allows new turf to to fill in damaged areas resulting in dense and lush turf better suited to fight weeds. Not only is a dense lawn aesthetically pleasing, it actually serves a purpose from a turf management perspective. 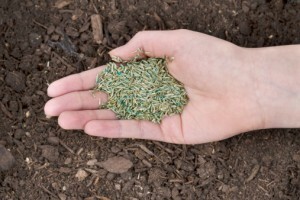 Dense lawns create a stronger base to fight the germination of weed seeds. This in turn allows for fewer herbicides to be used which in turn is more beneficial to our environment. Aerating and overseeding quickly improves lawns appearance. When most people think quick lawn, they think sod. The beautiful thing about having a cool season turf is that sod isn’t always needed. It certainly serves its purpose, but a lawn can be quickly and relatively inexpensively established from seed. It provides a quick solution to what appears to be a lackluster lawn. Thatch is made up of grass clippings and roots that do not break down very quickly. It tends to mat which is a perfect breeding grown for a host of negative pathogens. It often results in disease flare ups. We aerate multiple directions to insure we’re providing adequate coverage. The more plugs we can pull out of the ground, the more beneficial the impact to the soil. After aerating, we then overseed. We contact seed growers in the fall to have our custom blends put together for us. We target turf type tall fescues that score highly in the NTEP trials in overall apperance and brown patch resistance. At the time of overseeding, we also use our proprietary Organically Enhanced fertilizers to bring out the best in your lawn. Contact us today to find out how to save 15% on your aeration and overseeding! Oh, and refer and friend and earn an EXTRA 50$ off!